Time for some more healthy recipes before the Christmas drinking/eating season begins! 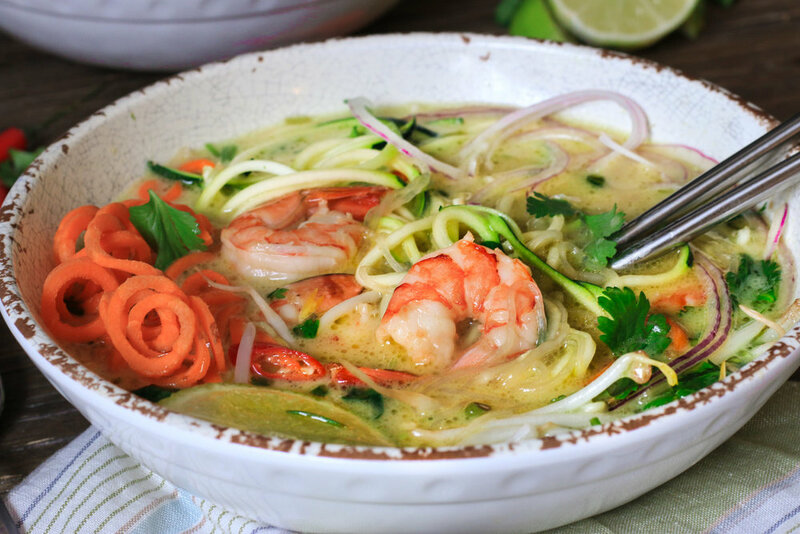 This soup is gluten free and dairy free and can be made vegan if you use vegetable broth instead of chicken broth, cut out the fish sauce, add an additional tablespoon of soy sauce, and leave out the shrimp. *I bought some dried ones from Silk Road Spice merchants at the farmer’s market so that I always have some on hand, but sometimes fresh ones are available at co-op midtown or at the Asian supermarket. If you can’t find them or do not want to make a special trip don’t worry about it – the soup will still be delicious! Scoop out the coconut cream from the top of one of the cans of coconut milk and place it in a large saucepot. Cook it over medium high heat and add in the curry paste, garlic and ginger. Once it’s bubbling, add in the cilantro stems and sauté for 2-3 minutes. Stir and add in remaining coconut milk from the first can and the full second can of coconut milk, chicken broth, lemon grass, carrot, fish sauce, soy sauce, lime leaves and lime zest/juice. Let simmer over medium low heat for approximately 15 minutes, stirring often. Watch your pot closely to ensure it does not boil over. Remove lime leaves and lemon grass stalks. Turn off heat, add in rice noodles, shrimp and bean sprouts and cover. Cook until rice noodles and bean sprouts are tender, and shrimp is pink and opaque, approximately 4 minutes depending on the size of your shrimp. Stir in chopped cilantro leaves and zucchini. Serve topped with red onion, Thai chilis and lime wedges.